In Manchester for a wedding so we spent a day at Salford Quays – and unexpectedly found myself in photographic heaven!! In December I ticked another goal off my retirement bucket list to visit the Christmas Markets in Europe. With a friend I ventured forth along the Danube. It was the most delightful and beautiful experience and well worth the years I have waited to achieve this! Vienna was magical and as we cruised back to Budapest the next morning the scene was as Christmassy as you could hope for with the riverbanks shrouded in a heavy fall of snow. I’m still here – just! Coming back to this has been on my mind for a while – I miss the pleasure of writing and recording my thoughts and feelings. Things are better – I feel as though I am resurfacing… coming back up from the depths where I’ve been for a good while now. Lots of reasons – of the new friends I mentioned last time some are still around, some I’ve let go. I don’t need to hang on to people who jar with me or who don’t share my outlook. I am not so desperate that I need to hang on to people regardless. Of those I’ve hung onto our friendship has grown – similar interests and a feeling that we want to get to know each other better. I have a new granddaughter who is an absolute delight. The joy of spending a few hours with her, watching her learn and grow, bring me more pleasure than I ever imagined as we awaited her arrival. As a result my days are busier, fuller – in fact I sometimes wish for an hour or so (let alone a while day!) to myself! Throw into that a couple of hours tutoring each week and January has passed without me even noticing the time of year – the time when I usually reach rock bottom! I’m also trying a multivitamin supplement and have recently started on a Vit D boost but I’ve yet to work out which of all these things is lifting me up out of the depths. Although I am slightly reluctant to admit it I do feel more settled. Reluctant because I don’t want to give up on my Norfolk-ness, the place I know I belong to; the place that is still more familiar to me than anywhere else; the place I still truly feel at home. The Welsh have a word that sums it up completely -‘hiraeth’. There is no English translation. It is a feeling more than homesickness, the loss of a place that is deep down in the very being of someone; nostalgia for the place that made you who you are and will forever be a part of you… and the hole that is left inside when you are no longer a part of that place. This is what I feel, and my soul still sinks every morning when I wake up and face another day away from home. But – things are looking up! Not making any promises but I may be around a bit more! 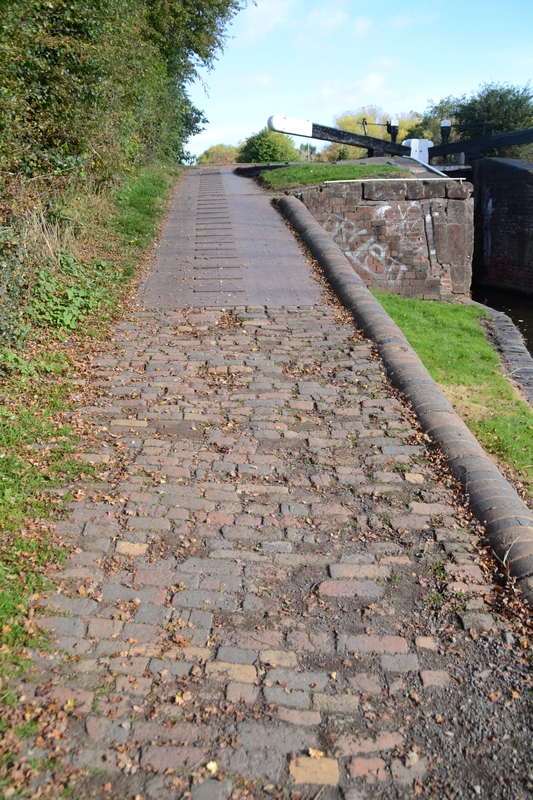 Cobbles on the towpath alongside the Stourbridge Canal – I wonder how many feet have trodden this way in the 235 years since it was opened? Out exploring my new surroundings this morning. Not quite as many autumn colours as I’d hoped for so I may have to retrace my steps in a few days! Some of the fruits of my summer……. those that are still untouched by the family, although I’m not sure how much longer that will last. 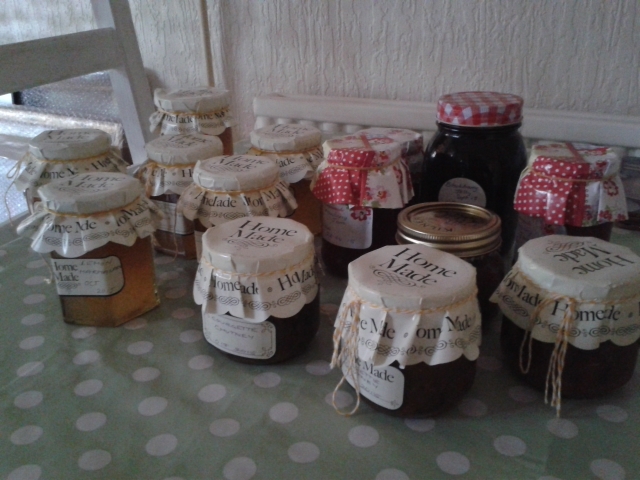 Lemon marmalade, courgette chutney, bramble jelly and strawberry jam…… and any number of cakes and biscuits that were very quickly consumed! Yes, I am still here, but it’s been a busy summer, entertaining friends, travelling and keeping up with the produce from my son’s allotment.